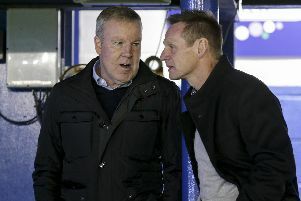 Pompey boss Kenny Jackett has told his squad to pick up where they left off in the push for League One promotion. The Blues have not been in league action since November 3 and get their title quest back up and running at Scunthorpe United on Saturday. Despite not having a League One fixture last weekend, Jackett's troops remained on top as second-placed Sunderland were held at home against Wycombe Wanderers. Now the Blues are looking to extend their advantage at the summit when they take on the Iron. Stuart McCall's Scunthorpe have struggled this season and sit 17th, but Pompey have not won in four visits to Glanford Park. And Jackett wants to see that run ended on their return to League One action. He said: 'We've had a really good week of training. 'The players have looked sharp and prepared. 'But most importantly, hungry for the games ahead. 'My main focus is to make sure we're not rusty. 'We want to hit the ground running and pick up where we left off. 'There has been a lot of intensity in training this week, it has been needed. 'But the players have responded well.